Before we set off for Kampala, there is one more thing we need to notice. On the map above there are two sidings leaving the station at its western end. One is short – it provides a rail link for a World Food Programme Warehouse (below). The second is a little more significant. It can be seen heading south in both of the maps immediately above. 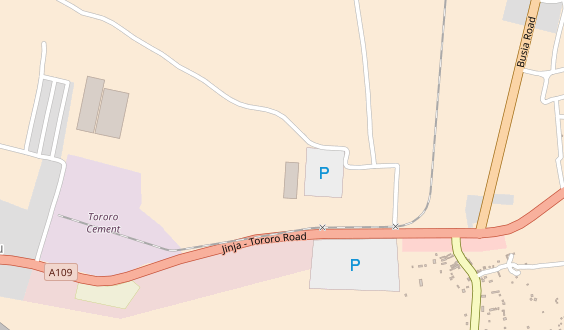 And can be seen continuing south past Tororo Airport, crossing Airfield Road, running about 300 metres to the west side of Busia Road (A104). 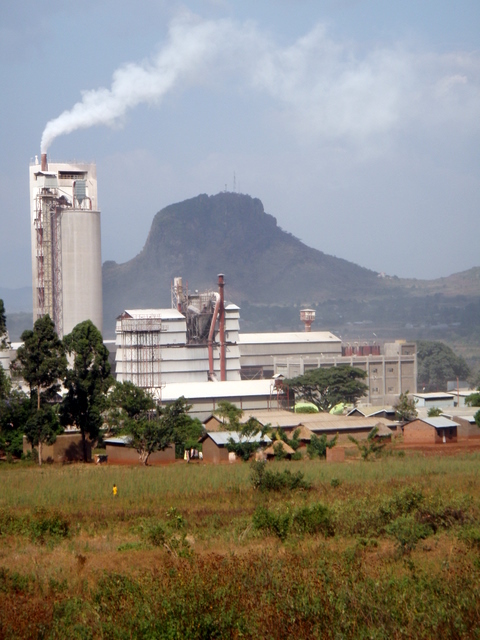 It then turns westward immediately alongside the Jinja-Tororo Raod (A109) to provide the rail link for Tororo Cement Works. This can be seen on the map immediately below. After having had a good look round Tororo, we set off for Kampala. Class 60 Garratt No. 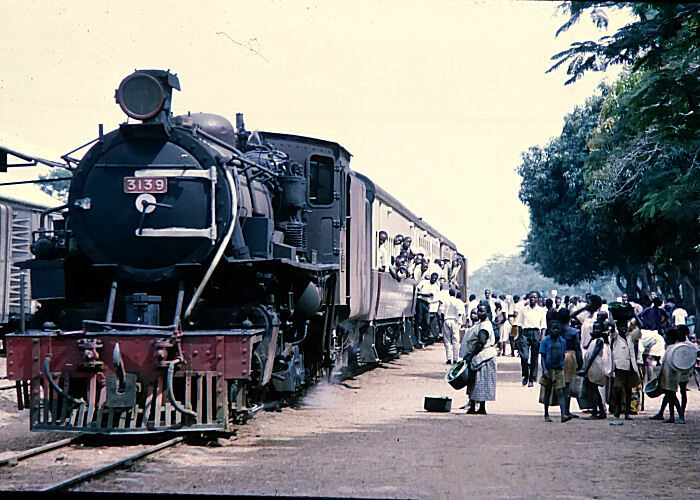 6023 in Tororo in 1971. The line to Kampala is on the left. The line to Pakwach is on the right! 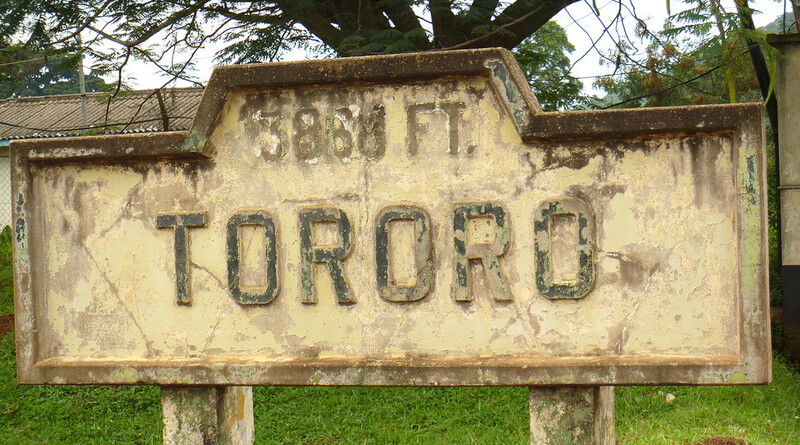 We leave Tororo is a north-westerly direction following the contours on the north side of the Nagongera Road as far as Achilet (about 5 kilometres outside of Tororo). 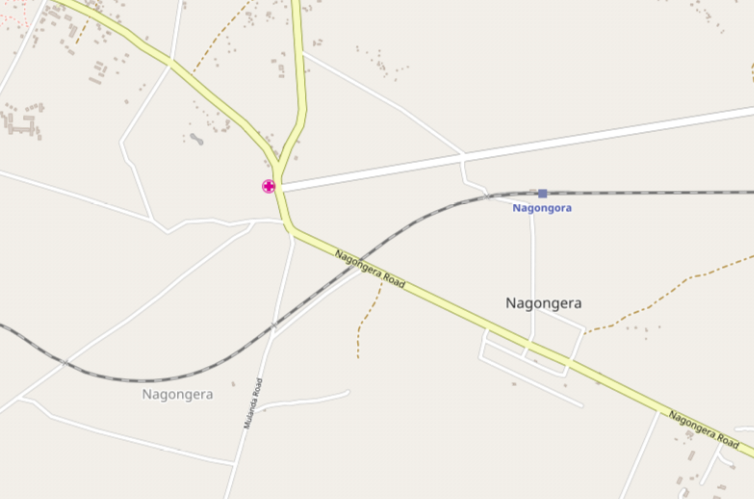 For the next 10 kilometres the railway stays north of the road until reaching Nagongera, or Nagongora, as the Station is named on the maps below. After Nagongera, the line passed through Budumba. 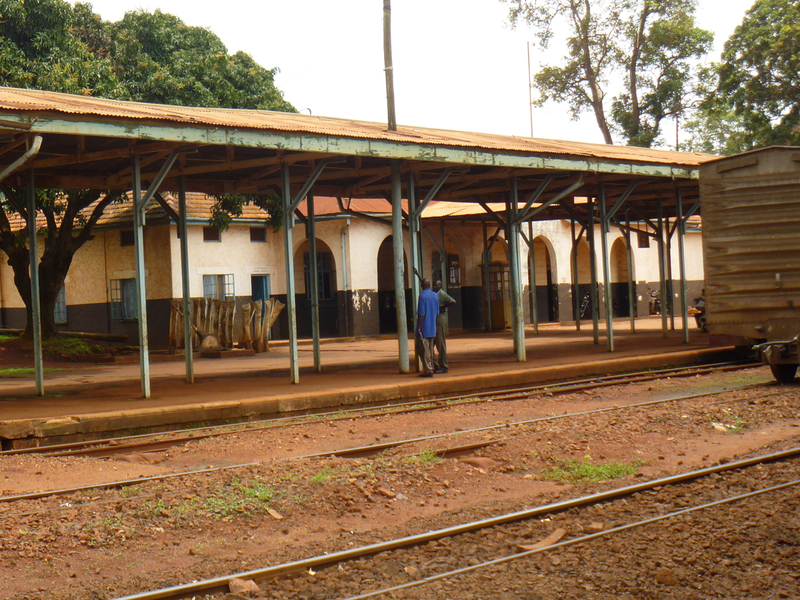 Budumba Station. After Budumba, road and rail combine to cross the bridge over the Mpologoma River. 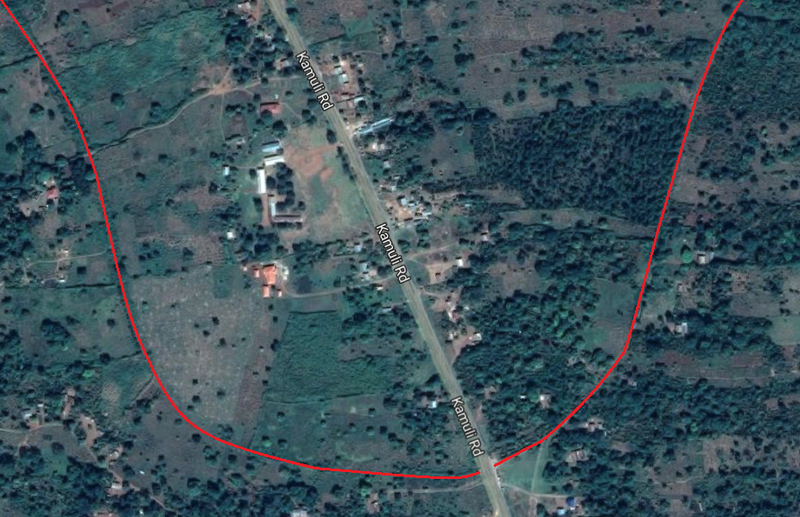 The line then splits with the northerly line crossing the Jinja-Mbale Road. 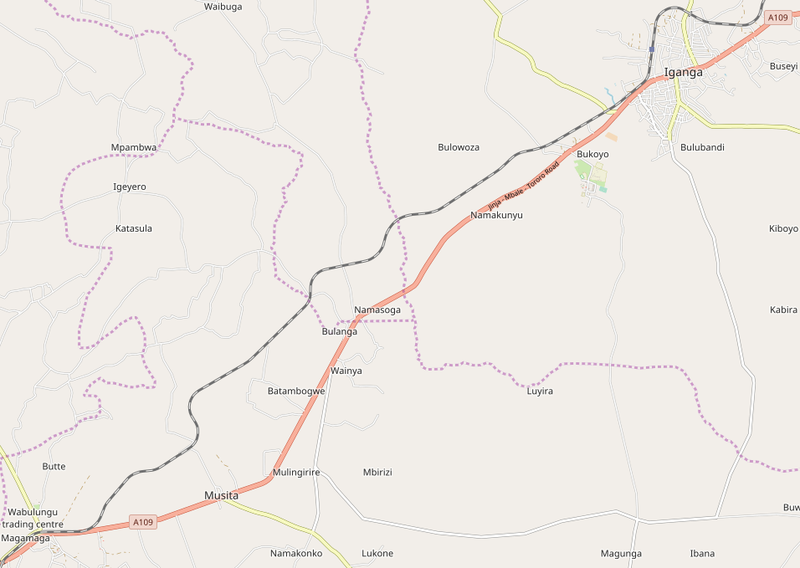 The shorter route to Jinja goes via Busembatia and along the Jinja-Mbale Road. 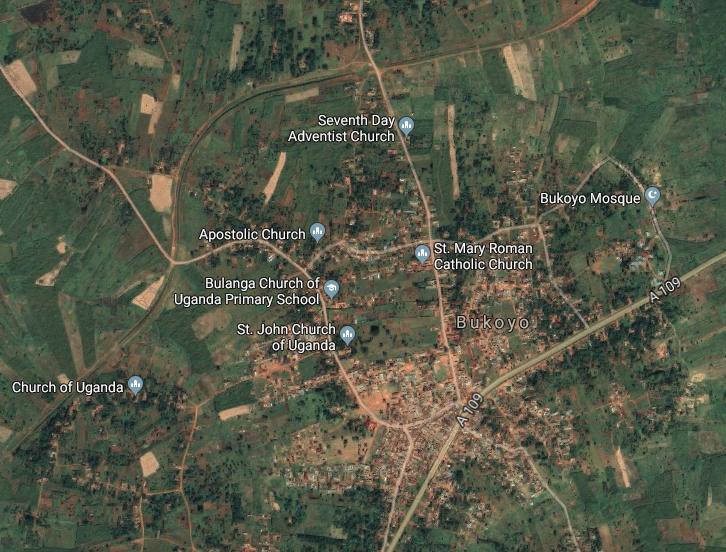 After Busembatia (where a link headed off to meet the more northerly line) the shorter more southerly line continues to Iganga (top right, below), Magamaga (bottom left, below) along the Jinja-Mbale-Totoro Road (A109) and then into Jinja. 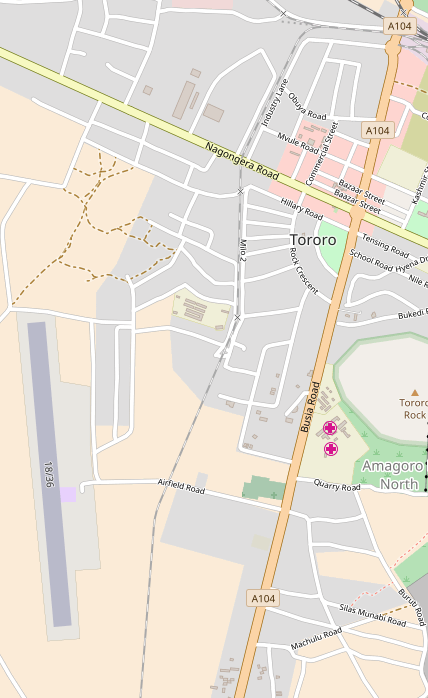 The line through the station at Iganga runs North-South on the West side of the town-centre as shown in the adjacent satellite image and map. 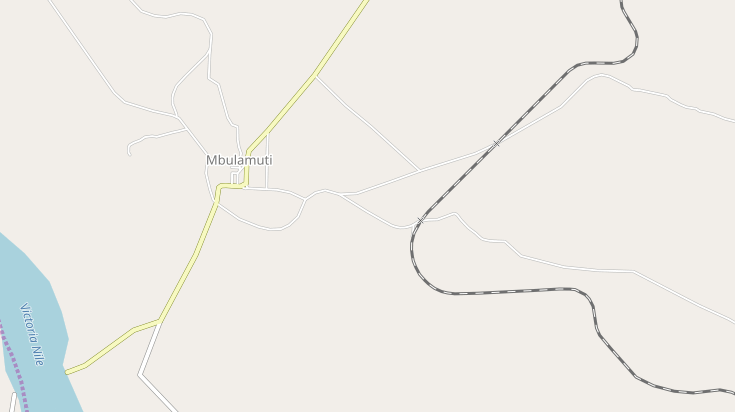 It then runs roughly parallel to the A109 before passing north of Bukoyo. 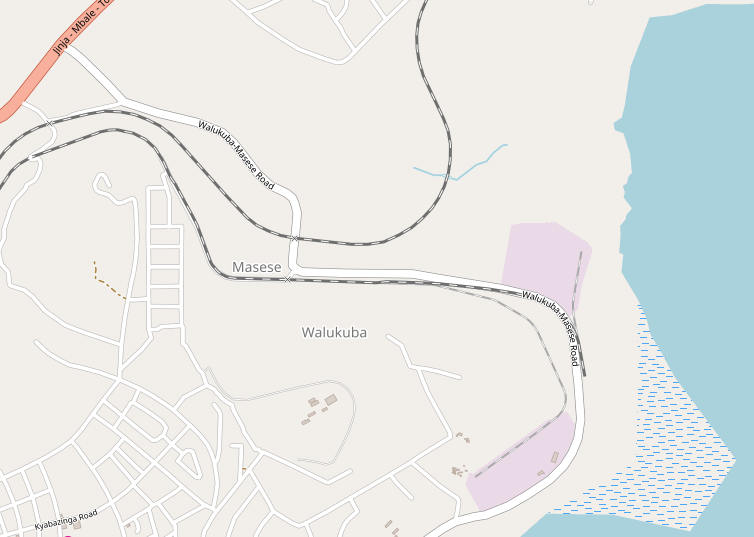 Which is a reasonable size town, for some reason not marked on the route map roughly where Namasoga and Bulanga are shown above. 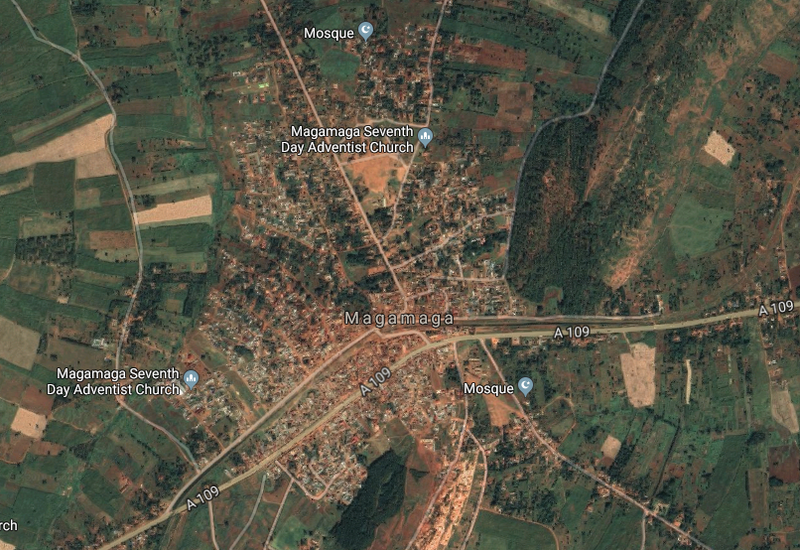 Magamaga is another decent sized town on the route of the line, indeed the railway passes right through the middle of the settlement, but there is no evidence of a station. 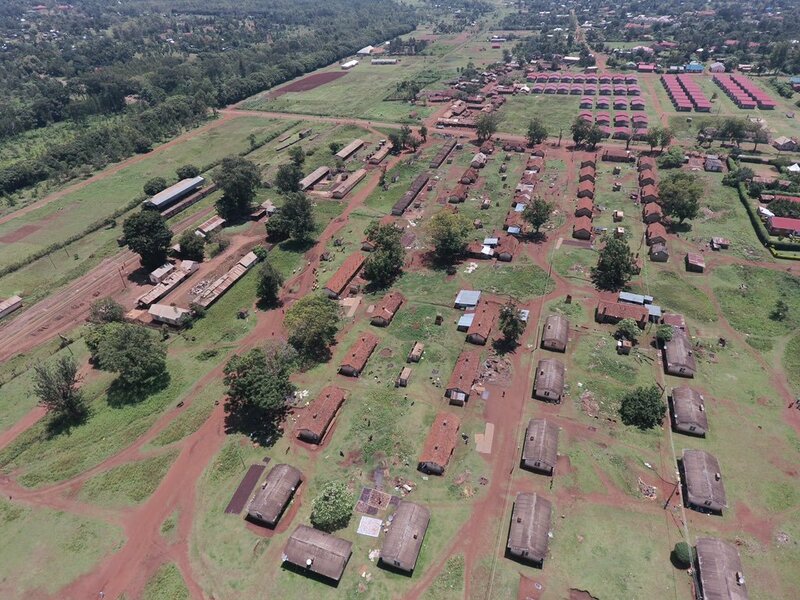 It seems highly unlikely to me that there would not have been a halt somewhere at Magamaga given the size of the town, even if it is no longer in use. 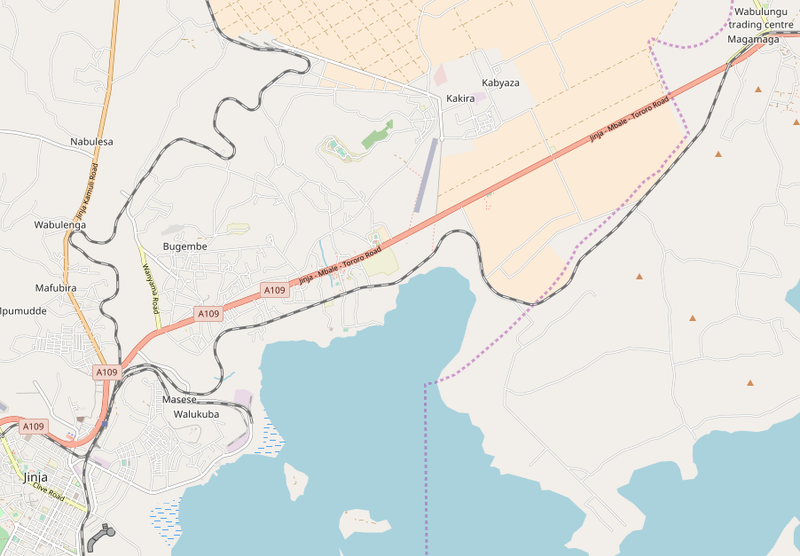 Just to the west of Magamaga, the line crosses the main Jinja-Mabale-Tororo highway (A109) by means of a bridge and then travels on the south side of the road and close to Lake Victoria before reaching Jinja. On its final approach to Jinja, the line travels alongside a branch-line which fed industry on the shores of Lake Victoria in Masese and Walukuba, before joining the more northerly route once again as it enters Jinja Station. 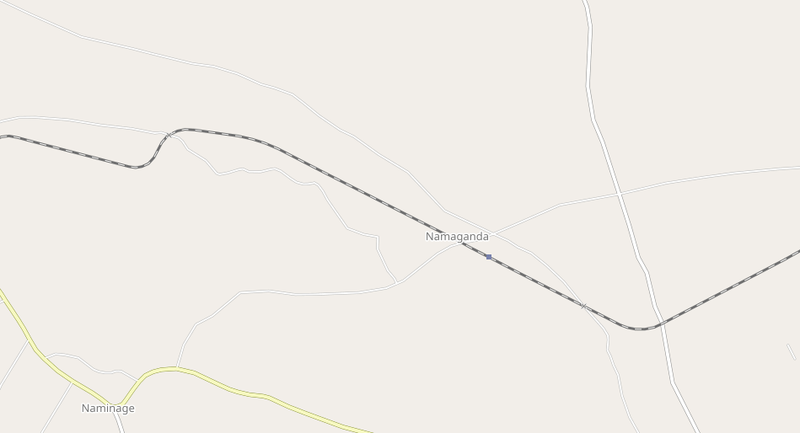 The more northerly route of the mainline passed through only one named Railway Station which appears on OpenStreetMap, that of Namaganda (Namabuga) – which is about a third in from the left on the map below, near the top of the image. 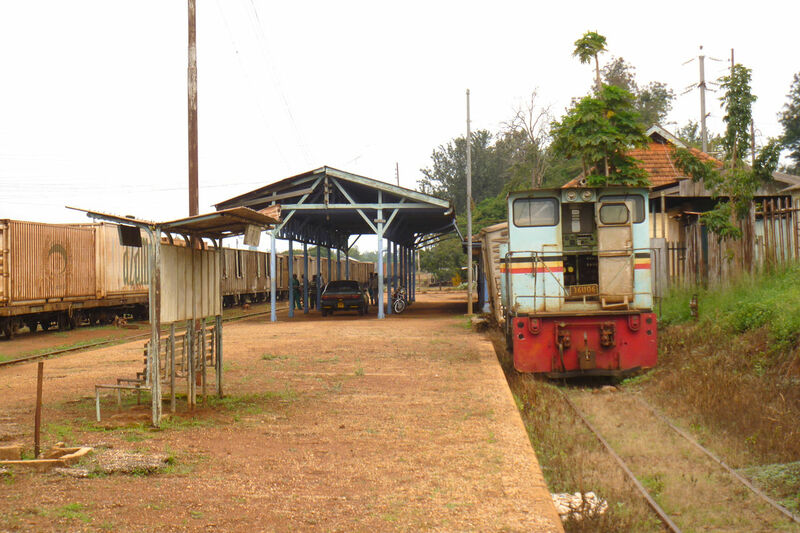 There was also a station close to Kamuli and at one time a branch-line which left the northerly route at Mbulamuti. The northerly route is considerably more torturous. As it seeks to maintain a steady grade the contours mean that is snakes down to Jinja and travels considerably further all told. 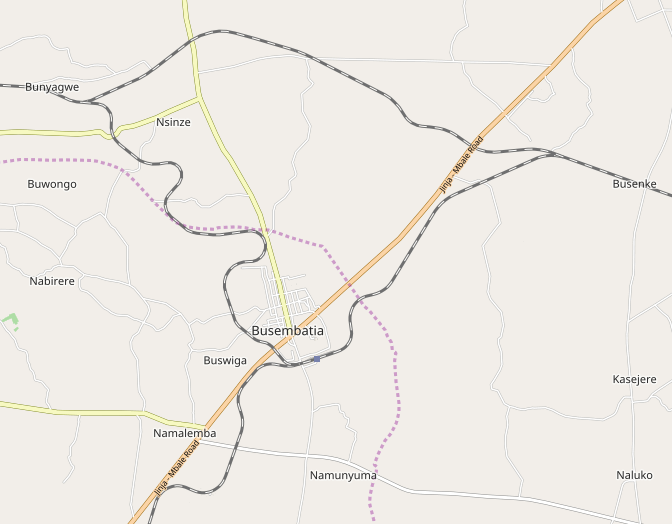 The locations of Namaganda (Namabuga) and Mbulamuti are shown on the maps and satellite images below. 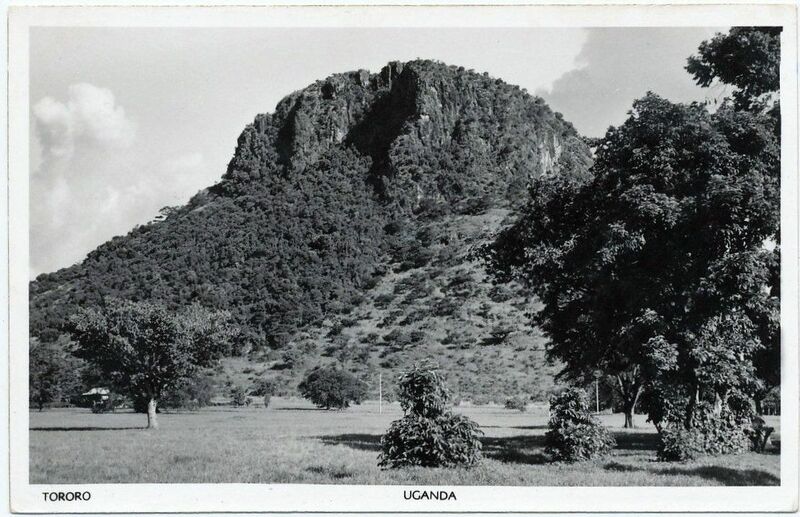 Namaganda (Namabuga). 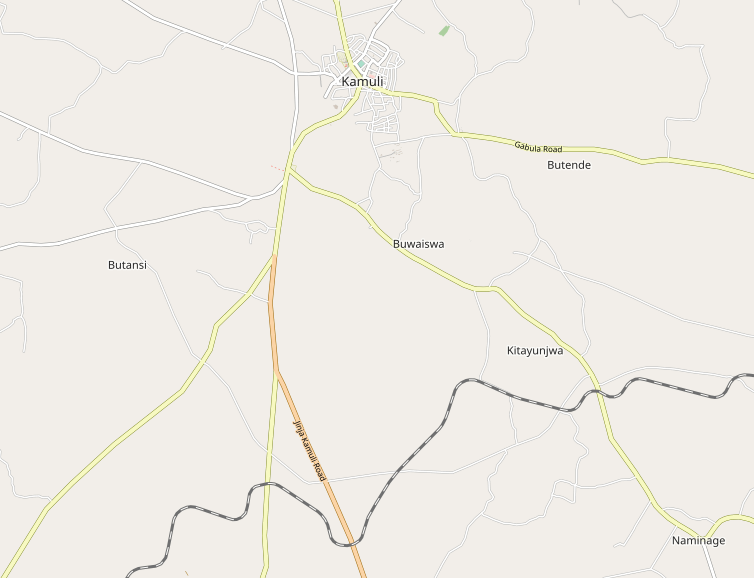 Kamuli was some distance from the route of the northern line (over 10 kilometres along the Jinja-Kamuli Road). 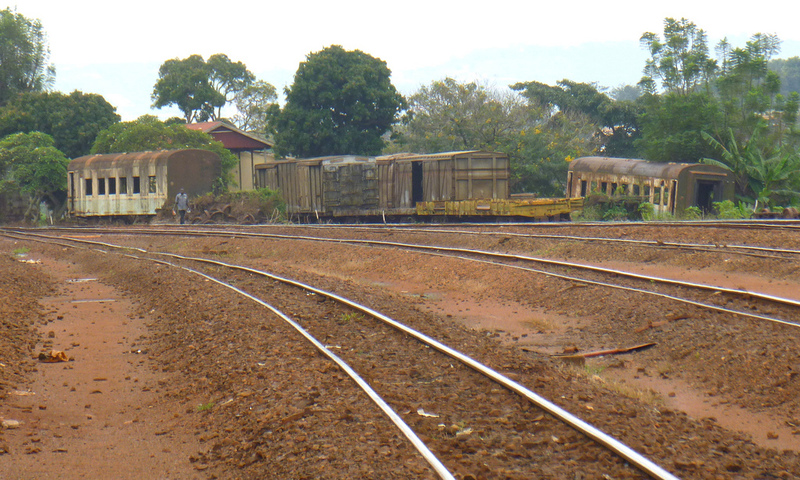 The station was reached by trains coming from Tororo after crossing the Kamuli-Iganga Road near Kitayunjwa. 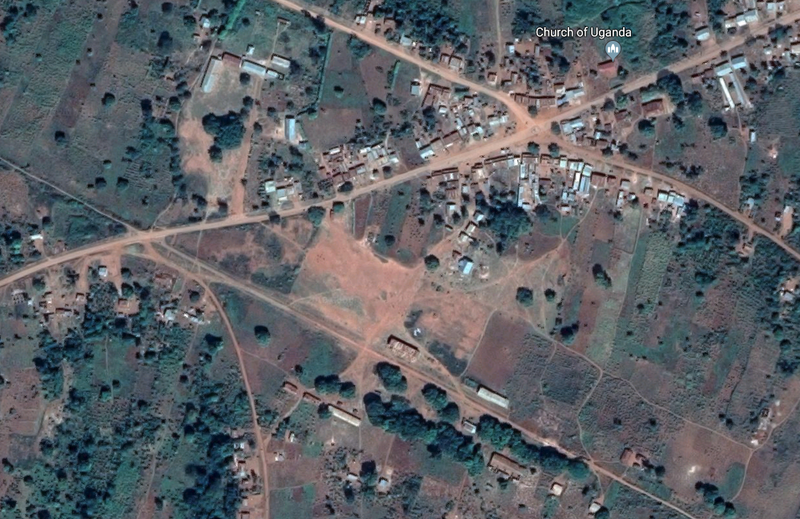 The first picture below is a satellite image of Kamuli Station site. 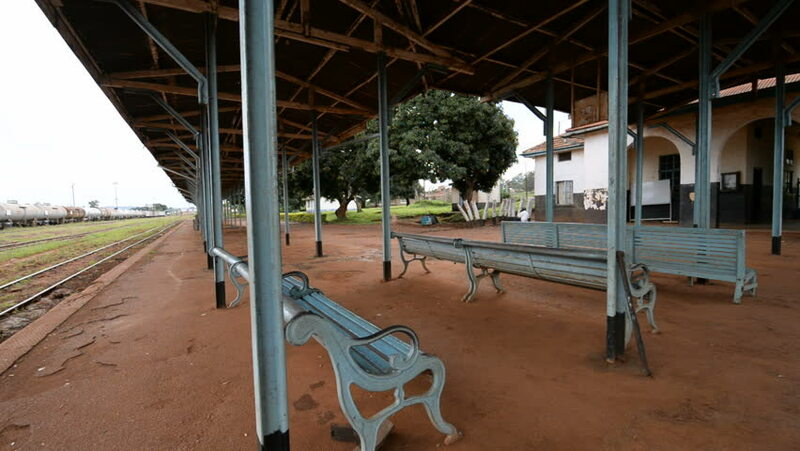 The second image shows Kamuli Railway Station in 1969. 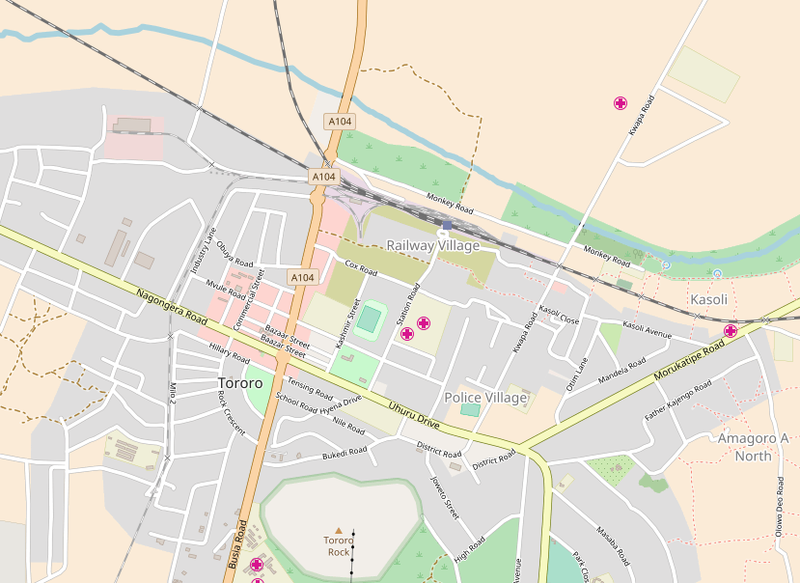 The third image is a map of the station site from OpenStreetmap. Tribal Class 31, No. 3139, ‘Pokomo’ was built by the Vulcan Foundry in 1956 and was allocated to the Uganda Railways in 1977. It is seen heading its train at Kamuli in 1969. Kamuli, the first station eastbound after Mbulamuti, was by-passed by first and second class Mail Trains after the Tororo-Namaga deviation was completed in 1962 but the all stations Nairobi/Kampala second and third class passenger trains were still routed over the original main line via Mbulamuti which was the junction for Namasagali (c) Glyn Constantine. 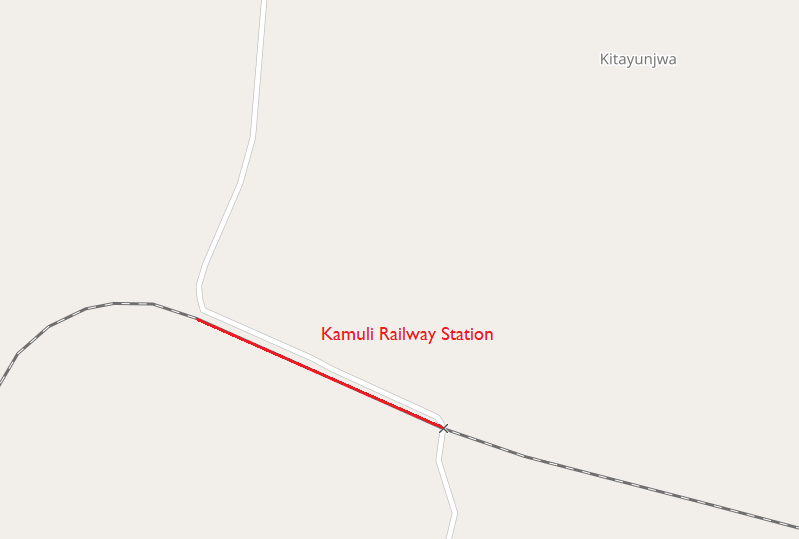 The railway travels on to cross the the Kamuli-Jinja Road as shown below and heads for Mbulamuti. 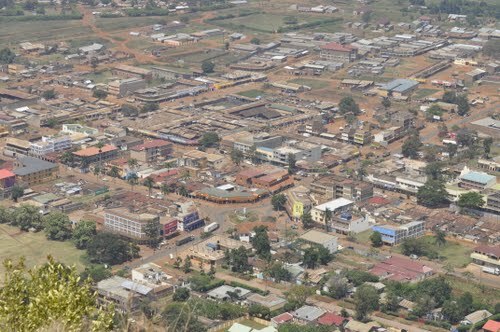 Mbulamuti. 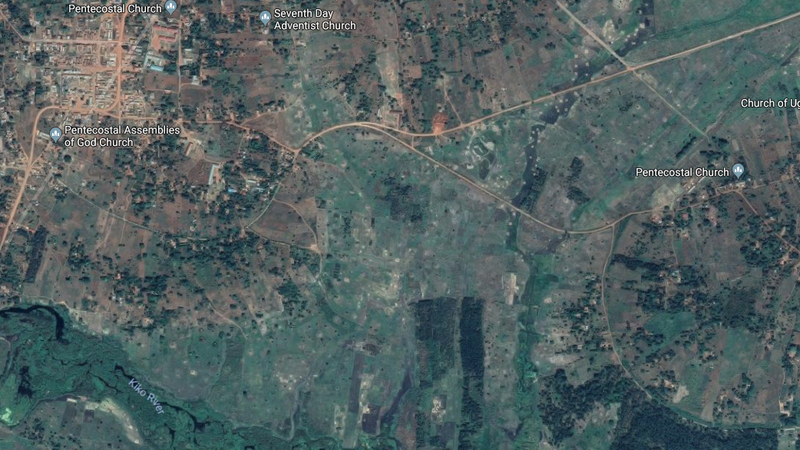 It is not at all clear, to me, where the station for the junction at Mbulamuti was, from the satellite images at least. 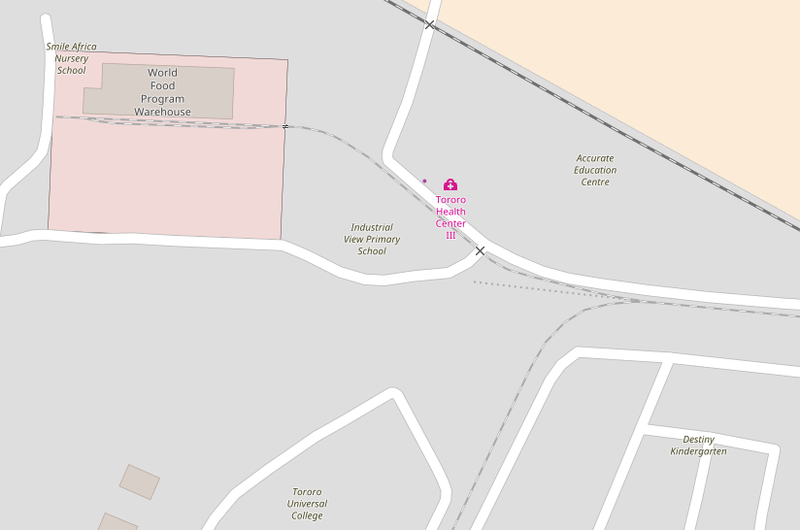 The location of the junction can be seen on the satellite image. The mainline enters the image at the top right, it is only vaguely visible. It drifts down in a south-westerly direction through the middle of the word ‘Pentecostal’ to some trees and then curves away to the east, leaving the image bottom right. The road, which leaves the route of the mainline at the trees runs along the route of the branch-line. The branch from Mbulamunti travelled north on the east side of the Victoria Nile. First it curved around the south side of Mbulamuti, and then sinuously followed the contours north. We will make this branch the subject of another post in this series. 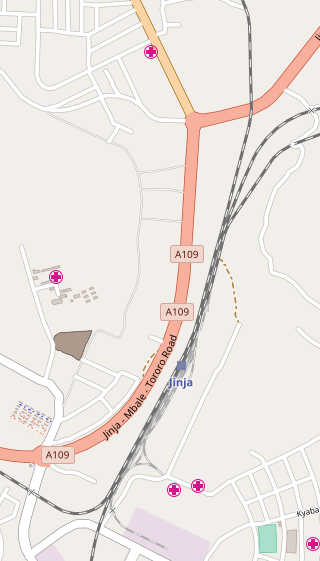 Both lines enter Jinja Railway Station from the North, as can be seen on the adjacent map. 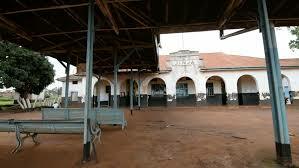 I had the joy of sitting for over 6 hours in Jinja Railway Station in 1994. 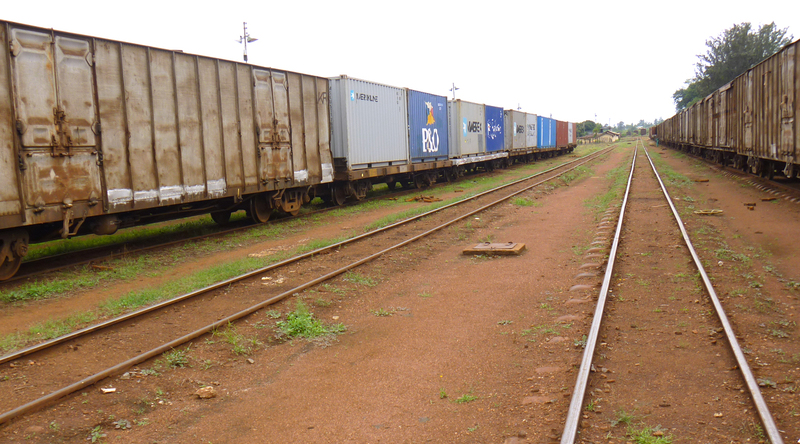 The passenger train I was on was held up by the derailement of a goods train between Jinja and Kampala. 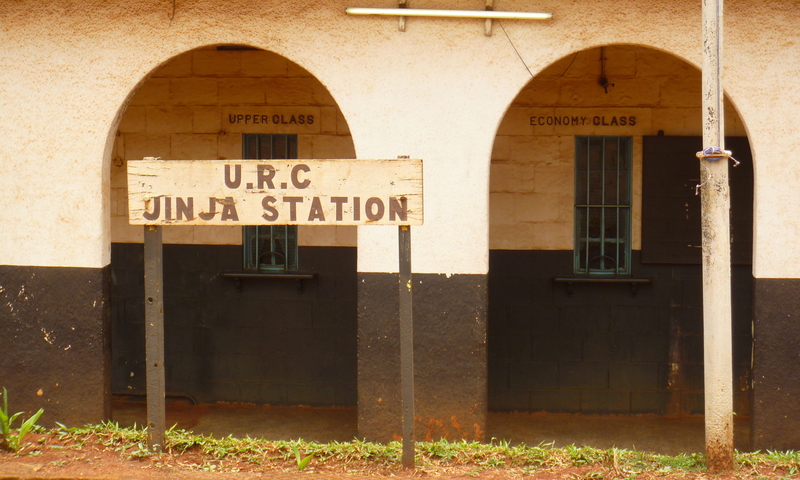 Our journey, in this post, ends here at Jinja Railway Station with a series of photographs of the location which can be seen below. In our next post we will set off from Jinja, cross the Nile and head on towards Kampala. 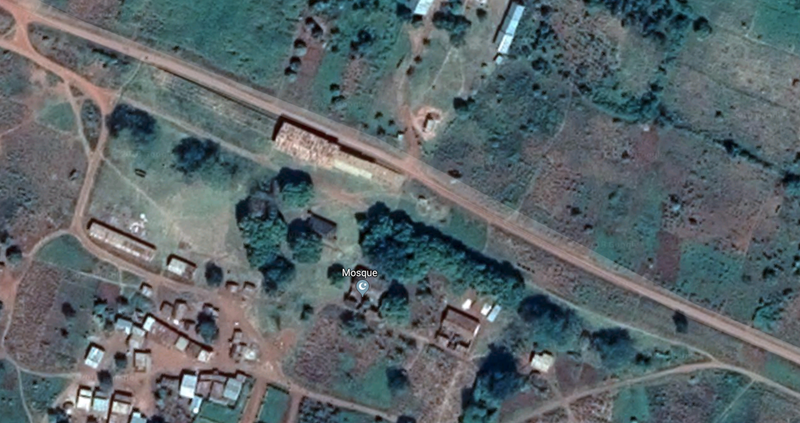 https://mobile.twitter.com/sgr_uganda/status/786565833401180164, accessed on 3rd June 2018.
http://ug.geoview.info/tororo_town,44672213p, accessed on 4th June 2018.
https://ekitibwakyabuganda.wordpress.com/category/history; & https://en.wikipedia.org/wiki/Tororo#/media/File:Uganda_railways_assessment_2010-14.jpg, accessed on 4th June 2018.
https://www.newvision.co.ug/new_vision/news/1309352/cma-discuss-funding-options-oil-minerals-meet, accessed on 4th June 2018.
https://www.newvision.co.ug/new_vision/news/1331523/tororo-cement-sh86b-expansion, accessed on 4th June 2018.
http://www.theeastafrican.co.ke/business/Hima-Cement-to-invest-USD40m-in-new-Tororo-plant-/2560-3393614-12oln7c/index.html, accessed on 4th June 2018.
http://www.monitor.co.ug/News/National/Cement-prices-shoot-up-amidst-scarcity/688334-4314252-q95be6/index.html, accessed on 4th June 2018.
https://theugandan.com.ug/umeme-upgrades-tororo-cement-industries-power-plant-doubles-production, accessed on 4th June 2018. This entry was posted in Railways Blog, Uganda and Kenya Railways on June 5, 2018 by rogerfarnworth.